There was this incident which unsettled me no end. A policeman came up to ask for help regarding his household helper. He was looking for this woman he entrusted his child with as baby sitter. I presumed at that time the law enforcer knew all along that his helper is related to a prisoner hence, when his helper was nowhere, he already knew where to go—in a prison camp. But what made his problem complicated was not the absence of his helper but a worrisome situation that the loss came when his child was also nowhere. It was blood curdling at most. What the lawman’s hunch turned into an investigative find. His prey, the house helper, was indeed inside the prison camp visiting an inmate believed to be her husband and with her was a toddler, his child! Prison officers requested by the law enforcer for assistance quickly moved to verify the information. Rightly so, the househelper and child were on record on a visitation privilege. 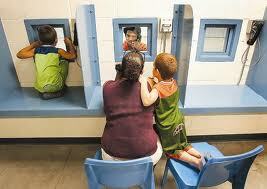 The prison patrol went to the site and accosted the woman and child to the office. There were no commotion, no drama. The procedure was conducted in a low key. The lawman was relaxed in the security office. There was no hysterics when the lawman saw his child; there was even no trace of anger when the lawman saw the househelper. It was, as if, the period was just an ordinary market day. The security officers, sensitive and trained witness this kind of situation, were texting each other messages to telegraph positioning in case emotional fireworks would be displayed on that day. Luckily, at least for those in the office, there was nothing of that sort. The lawman rose up from a homey sitting position, thanked the officers, picked up his kid and accosted the helper into his vehicle. The officers huddled in a corner after the incident. Versions were offered. The officer who fetched the house helper volunteered to add a brief interview he conducted. Accordingly, the house helper was heavy with her child by her inmate husband when she left for the province. But here comes conjecture. She may have suffered a miscarriage but there were information that she successfully gave birth but penury drove her to sell her child in her hometown. She went back to Manila thereafter and sought employment. In a brief period, she was employed as helper in the household of a lawman. Here, another speculation was given: one is that, the helper did not sell her child but brought the infant to Manila were a lawman agreed to adopt the baby. Another view was that, the helper was contracted by lawman as babysitter for the family’s baby. What complicated further the situation was that the househelper brought with her the child in her regular visitation course in prison and introduced to her inmate husband that the one year old kid was theirs. There was blissful period between visiting helper and her inmate husband until one day it would be disturbed by a security call. The child—believed by the inmate husband as his—would one day be the center of controversy when the real father, or so it seems, would appear before the prison gates to knock at reality. What a case. We never knew where to end. The beginning of the case has no definite start in the first place.